Frequently, new clients ask me where they should go to the doctor. 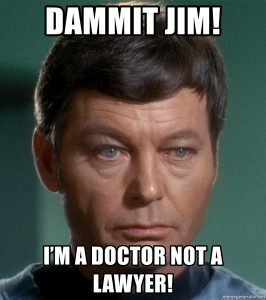 I give the usual disclaimer—I’m a lawyer, not a doctor (it’s a reverse Leonard McCoy, M.D.). But, I can offer suggestions. My preference is for clients to find their own medical providers, typically through their health insurance. The reason for this is twofold: first, it prevents any claim from the insurance company that the medical treatment was “lawyer-directed,” which is their claim that the doctors and lawyers are in cahoots, and conspire to give fake treatment or inflated medical bills. We know that the doctors we recommend are good, honorable physicians, but that doesn’t stop the claim. Second, doctors we know might not accept a client’s health insurance plan, and we find that it is best to have medical treatment paid for by health insurance—it often makes it easier to settle the case or pay out the case at the end. We might have to pay back the health insurer (usually not everything they paid—typically only two-thirds of whatever they paid), but at least if the worst happens and the case is lost, our client won’t have outstanding medical bills. That said, sometimes we need to recommend medical providers. In most cases, this is because our clients might not have medical treatment, or may not be able to afford the co-pays for extensive treatment. Doctors we recommend are usually able to hold off on receiving payment until after the case is concluded—that means they won’t bill the clients during the pendency of the case, and won’t send the clients to collections (which could ruin their credit, if they can’t afford to pay). If a client doesn’t have health insurance, they can usually tell a court that it is why they needed a doctor recommended by a lawyer, and it will often prevent any implication that the doctor is up to no good.